This is what Dr. Osamu Tabata, Dean of the Kyoto University of Advanced Science’s (KUAS) Engineering Department, talks about his vision for the innovative department, stressing the importance of a practical, solution-oriented mindset together with playful creativity. 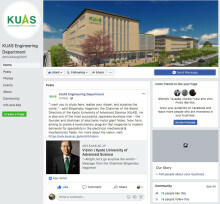 [News] KUAS' Engineering Department launches Facebook page! ​The Kyoto University of Advanced Science's (KUAS) Engineering Department has officially launched its new ​Facebook page! The Kyoto University of Advanced Science’s (KUAS) innovative engineering program took a major step towards becoming reality last December, when the entire faculty met for the first time at the university’s Uzumasa Campus in West Kyoto.